Over the next six months we are going to hear a lot more about Beren and Lúthien as the world gears up towards the publication of the book on the 4th May. But, for those unfamiliar with the story, who are Beren and Lúthien? Aragorn then proceeds to give the four hobbits a summary of the story of Beren and Lúthien: how the couple fell in love and both, sadly, died (twice). Throughout the book there are several references to the might and valour of Beren, and the beauty of Lúthien, but although the references give a sense of the depth of the mythology of Middle-earth, they seldom go beyond more than a paragraph. But it wasn’t until the publication of The Silmarillion in 1977 that readers were first treated to the story in its fullness. This was then supplemented with the publication of The History of Middle-earth series which showed us other versions of the tale, most notably the Lay of Leithian which tells the story in poetic format. Lúthien (pronounced “LOOTH-ee-en”) was an elf born in the early First Age, before Men even existed. The daughter of the Maia Melian (an immortal powerful being of Middle-earth; Gandalf and Sauron were also Maiar) and Thingol, the King of Doriath, Lúthien was one of the most beautiful people ever to walk the earth. She lives a happy and sheltered life in the kingdom of Doriath for many hundreds of years before she first encounters Beren. Her father, however, is extremely protective of both his kingdom and his daughter, builds an impressive city for himself, and covets the most beautiful jewels in the world. Beren is a nobleman of the House of Bëor who is in exile as a member of his father’s band of outlaws. One of the outlaws betrayed them, and Beren – the only survivor – strayed into Doriath and there first saw Lúthien. The two fell in love but Thingol would only allow the mortal Beren to marry the immortal Lúthien on the condition that Beren returns with one of the Silmarils from Morgoth, the first Dark Lord (and, at this time, Sauron’s master). With the aid of the elven-king Finrod and the great hound Huan, Beren and Lúthien succeed in retrieving a Silmaril from the Iron Crown of Morgoth, but the tragic outcome of the quest is their mortal deaths. It is as a result of the union of Beren and Lúthien that the first half-elves were born. This meant that some of their descendants had a choice to face: choosing to be an immortal elf (as Elrond chose), or a mortal man (as Arwen chose). As a result, the significance of their union continues for 6,500 years to Aragorn and Arwen. But to put them into context, Lúthien is a first cousin (once removed) of Galadriel. Beren and Lúthien are the great-grandparents to Elrond, and great-great-grandparents to Arwen; and, through Elrond’s twin brother Elros, they are the ancestors of all Númenorean, Gondorian and Arnorian kings, all the way down to Aragorn. More importantly, the Silmaril they took from Morgoth ended up with Eärendil and Elwing who took it to Valinor and pleaded for help in the war against Morgoth. The Valar (the gods) intervened, banished Morgoth, and destroyed Beleriand in the process. The Silmaril continues in the skies as the Star of Eärendil; the light of that star was enclosed in the Phial of Galadriel that was given to Frodo. The story itself widely recognised as one of the most beautiful, poignant and tragic in the entire legendarium. Tolkien himself regarded the tale as one of the three great tales of the First Age alongside The Children of Húrin (published in 2007) and The Fall of Gondolin (versions included in The Silmarillion and The History of Middle-earth). More importantly, the story has a personal significance to Tolkien. In 1917, a young Ronald (as Tolkien was known) saw his wife Edith dancing in a glade near Roos, Yorkshire; this scene was the germ of the story as Beren also first espies Lúthien whilst dancing in Doriath. 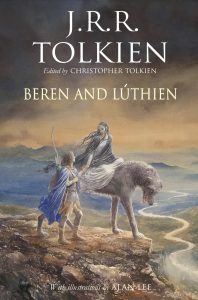 That year, Tolkien first wrote about Beren and Lúthien in The Lay of Leithian, and revised the story several times over the following 50 years. 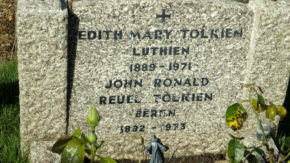 The publication of Beren and Lúthien marks almost exactly 100 years since Tolkien first saw his wife dancing, but their love is remembered on the couple’s gravestone where Ronald and Edith are listed as “Beren” and “Lúthien”. Beren and Lúthien will be published posthumously on 4th May 2017 by HarperCollins. For all press enquiries please visit our Press page.